 An evenhanded, thoughtful, but ultimately frustrating analysis of the sound-bite-driven confirmation process, by a scholar who regularly ventures into the public debate. Carter (Law/Yale; The Culture of Disbelief, 1993) analyzes some recent unfair campaigns (Robert Bork and Lani Guinier) and offers useful historical context. The Founders never intended rubber-stamp approval of Cabinet appointees, he writes; but the growth in presidential autonomy that began during the administration of Rutherford B. Hayes in the late 1870s means that only the imputation of exaggerated sins (``borking'') has any impact against nominees these days. He tartly points out that Senator Edward Kennedy, defending the much maligned Supreme Court nominee Thurgood Marshall, said it was inappropriate to probe judicial philosophy but did an about-face with Bork. 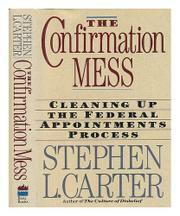 Carter criticizes litmus tests for court nominees, since they enshrine policy, not philosophy. He proposes that the Senate pursue several lines of inquiry: the candidate's qualifications; the respect of the public (which, he indicates, would have been the kiss of death for Clarence Thomas); immoral conduct (memberships in discriminatory private clubs); illegal conduct (but weighed against the importance of the law and the severity of the violation); unethical conduct (violation of professional standards of conduct). He suggests that some proposed reforms--such as that the Senate supply a list of possible nominees or an amendment requiring a two- thirds majority for approval--might help, while others--no TV cameras at hearings or election of judges--wouldn't. Carter's subtitle is, ultimately, a dodge, as he acknowledges that ``so few of the proposed repairs would make much difference.'' If we should learn to think of public service as a reward, not a calling, and the Supreme Court as a check on majority tyranny rather than a parallel force of public will, then shouldn't he have written more about how to change public attitudes?